The hearing protection workers want to wear. 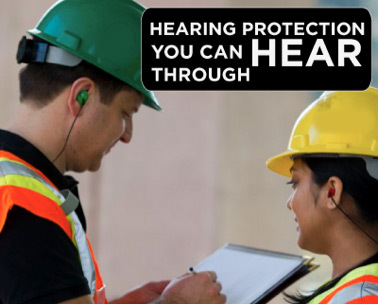 Do your workers want to wear their hearing protection? Do they take pride in ownership of their protection? Do they regard them as essential as safety glasses, hardhats and steel-toed work boots? Is this kind of attitude possible? It is and we’ll prove it to you with one conversation. Unlike disposable earplugs, these are hearing protectors that are fitted to the individual so every worker enjoys the same high level of hearing protection and guaranteed fit. 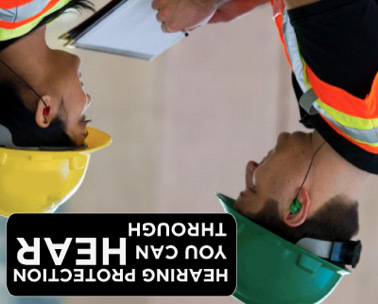 From small machine shops and manufacturing operations to large vehicle manufacturers and even NASA, over 4,500 companies across North America now depends on our products to protect their employees from hearing damage or loss. From an economic, safety and comfort standpoint, our protectors are unmatched in performance and effectiveness. As people lose their hearing, communication on the job naturally suffers. Head nods and automatic responses between workers not only leak productivity, they breed an environment ripe for accidents. That’s why when providing employees hearing protection, it’s important to make sure they can hear and communicate properly on the job. There is a new generation of protection completely effective in blocking out the decibel levels that can cause hearing damage. They use proprietary filters to “squeeze” high and low frequencies to block potentially harmful sound waves. Communication comes through, noise does not. 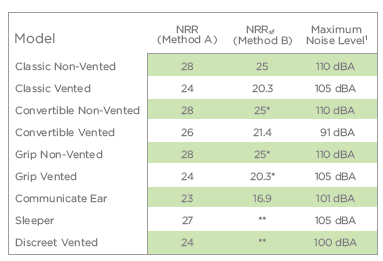 Check out the new generation of Industrial hearing protection. Think disposable earplugs are cheap? It’s a throw away assumption. Most companies believe disposable earplugs are the most cost efficient product. However, the average worker uses three pairs of disposable earplugs per shift, and that adds up to big money. True ear protection that is not disposable makes more sense. Period. Hearing loss is insidious. It invisibly eats away at the efficiency of your business as it drains a vital sense. Most people know that persistent or excessive noise in the workplace can cause serious damage to a person’s hearing. This damage can go undetected over a period of time, but when the loss becomes apparent, it’s too late to do anything about it. Once hearing is lost it can never be recovered. You can actually see through safety goggles. Can you hear through earplugs? If you have plastic ear plugs the answer is a very muffled “no”. Custom Protect Ear Inc. All Rights Reserved. Distributed in the USA by ProtectEar USA Inc.